During long history of planet Earth, massive extinctions and violent climate changes are the norm. 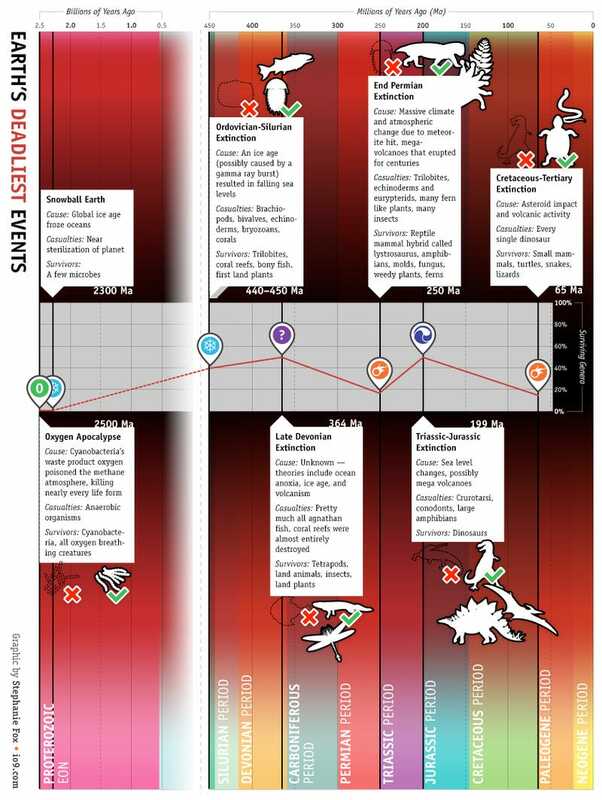 We've created this infographic to help you chart the rise and fall and rise of life on Earth over the past few billion years. Humans may have evolved during an unusual period of relative climate stability (despite those ice ages). What you see here are the biggest mass extinctions in Earth history and their places in the major geological ages of Earth. We've also got body counts - the line graph in the middle shows you how many species survived, which in some cases is nearly zero. It's hard to decide whether this is a pessimistic chart or an optimistic one. Life always manages to find a way, even when there is a serious destruction of the planet.